Last Lent (2011) we gave up TV, including John. I didn't think it was going to be that hard, but it made me realize how much I was letting John watch TV during the day. He usually watched a half hour show during the day, which is probably less than average. It was a nice break for me and he enjoyed that TV time. He would usually watch an episode of Blues Clues, Kipper, Thomas the Train, or Dragon Tails. I didn't see any harm in it... until we gave it up. During the first week of those forty days, John would get really crabby because he wanted to watch a show and I realized that I had been using that TV time to get things done. Essentially, it was babysitting John for me - something I vowed would not happen when I became a parent. But it's such an easy thing to get in the habit of! It turned out to be a great Lent and my eyes were opened to see that I can get things done without having the TV on for John. After Lent was over, we started watching shows again, but it's different now. He typically watches TV once a week and it is now a family time, where we all watch it together (minus Peter of course!). Set up Play-Doh or another craft that isn't too messy at your kitchen table. When he was younger, I would put John in his highchair to contain him and the mess. This works well when I am making dinner. When your children are playing alone, use your time wisely to get important things done - this could be anything from relaxing to scrubbing the toilet - whatever is most important to you! In my experience, if I am deliberate about what I do in my "free-time", there is plenty of time to get things done without having to use the TV as a babysitter. Audio books can be a great alternative to TV because they are entertaining, don't require parental involvement and still utilize your child's imagination. 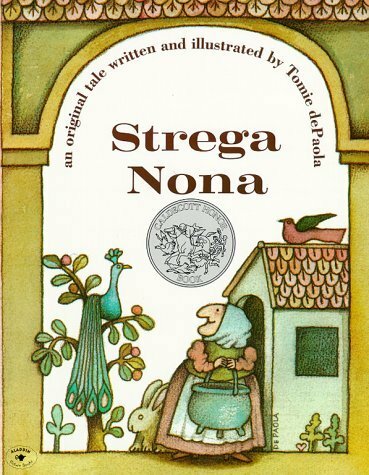 We have Strega Nona on CD, read by the author, and John LOVES it! Be sure to check out the audio book section at your library! Keep your kitchen sink clean and empty so you can pull up a chair and have your child play in the water with some plastic toys (another good activity during dinner prep). I put a towel on the chair to make it less slippery and use it to clean up any spills after playtime. Hard to believe this was over a year ago! 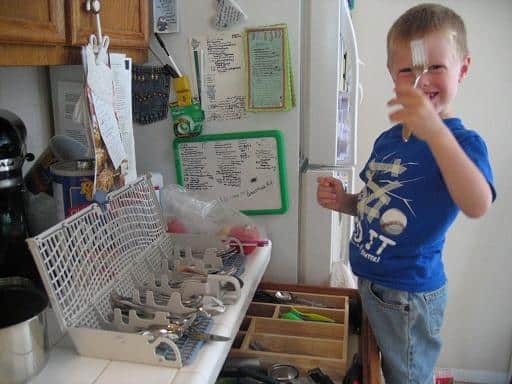 Check out this post for ways kids can help in the kitchen at every age. Do you have any other ideas? I'm always looking for new things to try! I think I need to greatly reduce my own tv time... Some days I sit on the couch so long that my bottom gets sore. That's sad, huh? lol I need to get outside more and start back walking with the baby in my jogging stroller. I know playdough is so much fun, but I've still been avoiding the mess. One thing we have discovered is I'll let her have a bowl of beans and she'll spend an amazing amount of time scooping and pouring. And not too many dropped. My biggest struggle with cutting out tv time is trying to get Elena somewhere else while I put Madeleine down. Any tips for that? Elena is starting to listen well enough that she can stay in the room and be quiet, so maybe it was just a learning curve. Glad Elena had fun washing dishes! The hardest part for me is keeping the sink empty so it is ready for John. Great idea with the beans! I'll have to try that. I have the same problem with John at Peter's nap time. That might be a good opportunity for a book on tape. I'm glad it is getting better for you. Lately I've been laying down with Peter in our bed and I tell John to go in the living room and I'll meet him there once Peter falls asleep. I usually have to shoo him out of the room a couple of times, but he eventually stays out. And when I come out to join him, he is excited to have one-on-one time with mommy.